In this perceptive and stimulating book, Professor Wallace-Hadrill traces the development of Western Europe from the dissolution of the late Roman Empire to the emergence, in the tenth century, of the individual states of medieval Europe. 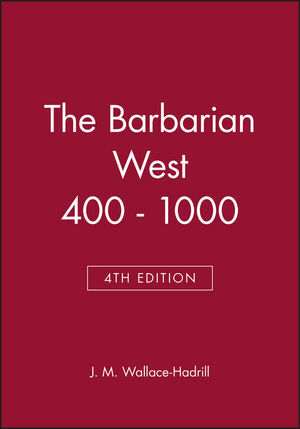 Now in its fourth edition, The Barbarian West contains a fully revised and up-to-date bibliography. J. M. Wallace-Hadrill, formerly Chichele Professor of Modern History, was Emeritus Fellow of All Souls College and Honorary Fellow of Merton College and Corpus Christi College, Oxford. 3. Italy and the Lombards. 6. Spain and the Visigoths. 8. Revised Bibliography: Roger Collins. Europe at the accession of Justinian. The Western Empire 843 A. D.
* A classic work by a master historian, now reissued with updated bibliography. * Provides analysis of the complex role of 'barbarians' in the Fall of Rome. * Offers concise overview of the development of the Germanic successor states, including, imperial rule under Charlemagne.